Ron O'Connor emailed us on April 26, 2012 with the sad news that our classmate Sandy Whybark (Smith) died on Sunday, November 28, 2010. Ron noted that he doesn't "know all the particulars other than she had developed lung cancer and was hoping to be elected for treatment at the major cancer center. During the last few months she stayed to herself and didn't want anyone fussing over her. She was my best friend from when we were kids at Roosevelt elementary school. She was always beautiful to me and will be forever in my heart." 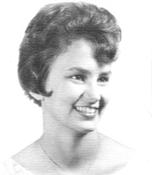 Sandra F. Smith, 63, died Sunday, Nov. 28, 2010, in Corvallis. Arrangements are under the direction of McHenry Funeral Home. Click here to see Sandy's last Profile entry.